Recently, the US Department of Energy announced it has two forms of finance available to catapult the speedy development of enhanced geothermal systems into being. The stimulus package will spur growth of this type of energy by 15 to 16 percent by 2012 or 2013. The sector will benefit from the provision of $42 billion worth of grants for renewable energy and new technology to boost efficiency, along with over $130 billion in tax credits and loans. So what exactly is geothermal energy, how does it operate and will it become widespread? 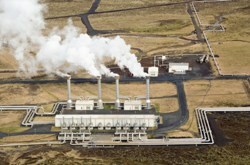 The concept of geothermal energy has been around for many years already. There are around 6 million households and businesses in the US that run on geothermal energy. Half of those are directly connected with geothermal power plants while the rest of the homes rely on their own geothermal heat pumps, according to information from the Geothermal Energy Association. The homes that use a heat pump operate electrically powered systems which directly tap into the energy stored in the earth, using the relatively constant temperature and in some cases ground water as an energy and hot water source. “[Geothermal pumps] are 3.5 – 5 times as efficient as the most efficient fossil fuel furnace”, according to the association. In other words, for every unit of energy used to power the heat pump, 3.5 – 5 units of energy is generated. Houses or businesses situated close to a direct geothermal source often create a direct use system. They tap the heat or cooling in the soil and use it directly in industrial processes, aquaculture ponds, greenhouses or heat systems in buildings. This method is said to lead to energy savings of up to 80 percent compared to fossil fuels. It is relatively simple to build geothermal heat pumps or electricity generators because the level at which the earth turns warm is only around three feet or more. The earth’s frost line, the point underground at which the temperature always stays above 32 degrees, tops this layer. Pumps are connected to the warmer depths by an earth loop of piping. The loop transports the natural heat to indoor units, even in winter. The energy of the heat particles are compressed which increases the heat content and distributed throughout the duct work in homes and businesses. In summertime, the opposite happens; heat from homes is absorbed by the heat pump and transferred back to the earth. To achieve cooler temperatures than the standard constant, the pump´s compressor supplements heat transfer. The geothermal market is beginning to be seen as an attractive way to generate alternative energy and hot water for industrial and home use. If the projects receiving government funding are successful it’s likely that this market sector will definitely take off. But the geothermal sector has yet to clear a number of hurdles before it will have become an established type of renewable energy. Obstacles include legal, financial and even environmental issues. For instance, Colorado sees geothermal energy as a water resource while Utah regards it as a mineral resource. What’s probably more important is the investment side. Before this type of energy really will have spun into an investment (asset) class of its own, a lot more (venture) capital is needed in the new technology facilitating efficiency. “There’s a need for capital in this market,” says Joani Matranga, a representative of Colorado’s Governor’s Energy Office an a member of the Colorado Geothermal Working Group. The Group recently met in order to identify geothermal resources for economic development and expand direct use of heat energy. “There are lots of funding instruments we are starting to explore,” Matranga said. The Group applied to the Department of Energy for financing and might also issue renewable energy bonds. That way, public entities can raise cash for renewable energy projects. Outside the U.S., the solution is most popular in Australia, a country which ranks high on the list of top net energy exporters. The country´s Panax Geothermal announced recently that it is developing possibly the first grid connected geothermal demo plant in Australia, launching a “hot rocks” clean energy service in earnest. The reason why geothermal energy really is worth investigating is that renewable resources, contrary to what you might think, are still by no means going to be catering to the world’s energy requirements to any degree of abundance. Even countries with the highest level of alternative energy resources and the most audacious plans are often practically not able to achieve the growth levels they’re committed to. The issue with sustainable energy is not which option to go for, because most countries can’t permit themselves such luxury. The main issue in sustainable energy is to grow as many resources as rapidly as possible and even then the efforts might still not suffice. Numbers recently published in an article in TheSpaceReview indicate that if the US is to meet its 2100 need for 1.6 times it current energy consumption, sustainable energy production will have to increase by 11 times the current level. By the same token, if the world energy production needs of 2100 (pdf) are met, renewables have to increase by a factor of 23 from current levels. “In the United States, this means that today’s total energy production capacity of nuclear, hydroelectric, geothermal, wind, ground solar electric, and land biomass must be added every decade through the end of the century,” according to James M Snead. And for the world to meet its extra energy requirement, the equivalent of 138 new Hoover Dams must go into operation every year through the end of the century, Snead believes. Nicely done piece. It would be helpful if you could elaborate on the different types of geothermally-derived energy. The term “energy” is used a number of times throughout the piece; in different contexts you seem to be referring to thermal energy and electric energy without making a clear distinction as to how each applies to geothermal applications. Geothermal for thermal energy (space heating/cooling and other thermal process-uses) can be done at the large scale (think district heating systems) or the very small scale (single-home installations, for example) This is probably the most common type of geothermal that people think about. Thanks for the comments. I appreciate your insight. We’ll do a followup on this.